New Testaments is a monthly retrospective in which Amr Al-Aaser presents an overlooked modern game and champions its best ideas. Sonic the Hedgehog might be fast, but he’s probably not the first thing that comes to mind when you think of top tier arcade racers. 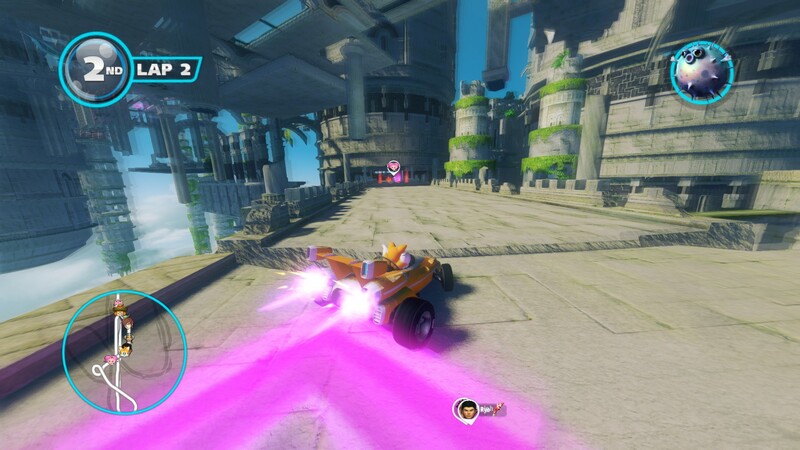 So it might catch you by surprise to find out that Sonic & All-Stars Racing Transformed manages to not only build on the legacy of games like Outrun 2, Split Second and Blur, but takes the mascot racer, a genre that often aggravates players with its random elements, and turns it into a serious competitive racer. All while being an absurdly fun celebration of all things SEGA.The first game in the series, Sonic & SEGA All-Stars Racing, built on the sublime drift mechanics and challenge modes developer Sumo Digital brought to Outrun 2006. It also set the standard for SEGA fan-service, with offbeat choices like Fantasy Zone’s Opa Opa and the Bonanza Bros as unlockable racers. 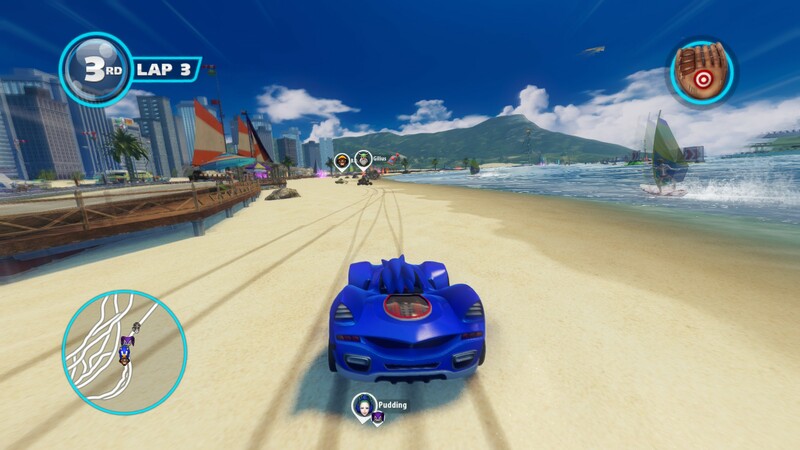 Still, Sonic & SEGA All-Stars Racing was a little too messy for serious competition: the powerups are uneven, and the track design isn’t quite there (it might be accurate to have 90° turns in the Monkey Ball stages, but it isn’t much fun to drive on them). That’s where the sequel comes in. Sonic & All-Stars Racing Transformed takes the drifting and structure of its predecessor to and seriously refines it. Thanks to the success of the first game, Sumo Digital was able to take in members of the shuttered Bizarre Creations and Black Rock Studio. The legacy of the aforementioned Blur and Split Second shows through here, with a competitive refocus on weapons and dynamic stages that change lap to lap. 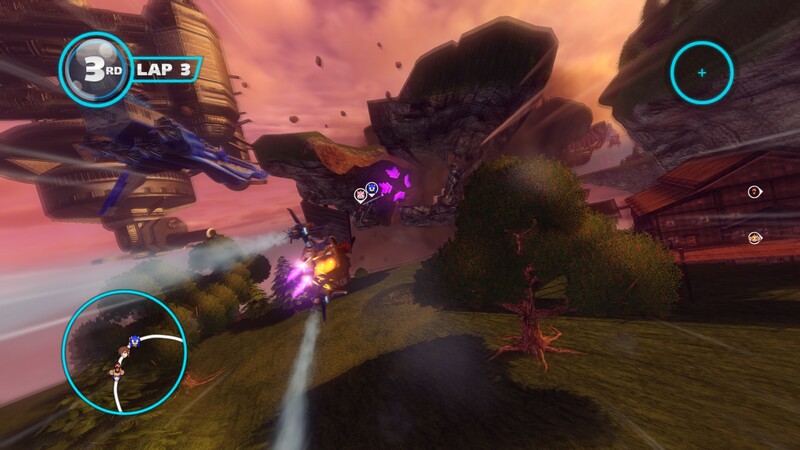 These stages tie into Sonic Racing Transformed’s headline feature–the ability to change between three different vehicle forms. Each vehicle has its own set of nuances to master. Cars can hold drifts almost indefinitely, reversing the direction of a drift effortlessly, allowing you to trace the best racing line through the corners while hitting every boost pad. Hold a drift long enough and you’ll charge up to three drift boosts, with each charge granting longer and faster increases of speed. Crash or get shot, however, and you’ll lose your charge, making clean racing a must to reach top speeds. Boats handle similarly, but open up the track to compensate for the wider drift arcs, and allow you to take advantage of airtime granted by launching off ramps or cresting a wave to get small boosts granted by doing tricks. Airplanes are the most uneven, initially seeming to have a bit too much airspace, leaving a disconnect from the tight encounters of the other modes. Dig deeper and you’ll find you can gain more speed by diving and doing Risk Boosts–boosts granted by rolling or flipping out of the way of an incoming obstacle just in time–which turns static scenery into an obstacle course you can use to gain speed in between passing boost rings. It’s far from, say, the daredevil antics encouraged by a dedicated plane racer like Skydrift, but it adds a rewarding play between risk and reward. These different modes give you a lot to master and even allow you to sneak tricks in while transitioning between forms. They’re also integral to navigating the deformations of the the track that prevent the monotony of racing the same course for three laps. Unlike Split Second these changes aren’t player controlled, but nonetheless allow a ridiculous amount of chaos and spectacle to happen between courses. On the Panzer Dragoon stage a crashed craft causes the earth to slump into a river where sea creatures roam, and the bridge on the main path gives way when a dragon breaks through it. The House of the Dead stage takes you from the entrance of the Curien mansion into the torn up attic, draining into the waterways of the sewers, before passing through a concert stage on the final lap, inspired by the obscure dating game of the series, Loving Deads. The Skies of Arcadia race takes place during an air and sea battle, with the stage being set ablaze, and ships exploding alongside the docks, climaxing with the stage itself being torn completely apart, leaving you to navigate the chunks of it still suspended in the air. These events alter the path through the stages from lap to lap, or open up new paths, forcing you to adapt as your vehicle changes to suit the situation. And even after you learn the scripting behind those changes it keeps races feeling chaotic and alive. After nearly 40 hours with the game it still feels fresh, and I’m still noticing new details to appreciate. Of course none of this would matter if it couldn’t address the biggest complaints about mascot racers: the slot machine-like change of race position randomized weaponry can bring. Even in the best of the genre, it seems like there are endless complaints about how bad luck can squander the efforts of even the best drivers. To be clear, this is a legit design choice for racing games interested in narrowing the skill gap and providing a competitive chance to less experienced players, even if it is deeply frustrating. 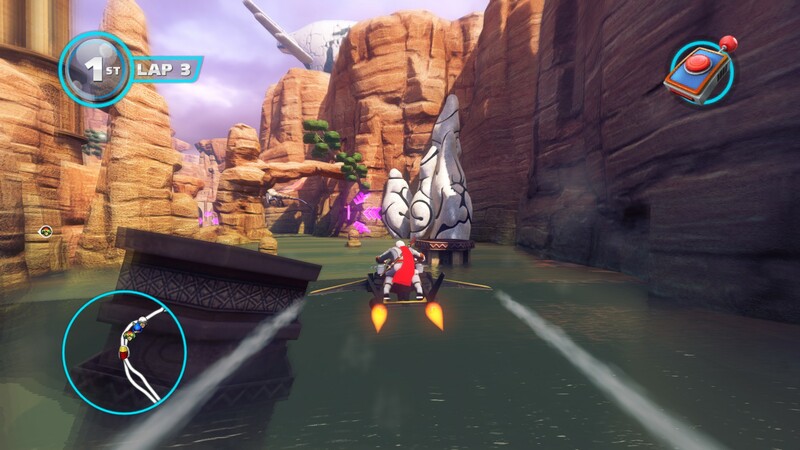 The cartoon weaponry might initially seem to put Sonic Racing Transformed into that group, but bump up the speed class and take a closer look at the weapon balance and you’ll find that a game much more interested in competition. Sonic Racing Transformed doesn’t go as far Blur does to turn weapons into a tactical choice. Weapons are still dealt out at random from item boxes, and you can only carry one at a time in most cases. But look closer and you’ll see a lot of Bizarre’s philosophy towards weapon balance in Blur has carried over, to the point where some weapons feel like direct analogs. This is best illustrated by how Transformed handles its equivalent to the blue shell, the notorious Mario Kart weapon that cuts a path to the first place player and takes them out with little to no opportunity to retaliate. In Transformed this takes the form of the Swarm, a group of bees that set up as a series of obstacles for the leading players. They’re difficult to avoid, but can be with careful driving. A similar philosophy applies to the other weapons. You’ll almost always have an option to deal with incoming attacks, whether that’s countering one weapon with a well timed shot of your own, or simply using a boost or juking between track hazards to escape. There’s some nuance to weapon usage as well. Weapons sometimes come in threes, and you can make the choice to either fire them off one by one, or use them all at once, which is useful when you want to make a blockade of traffic cone mines, or turn a set of three boosts into one long one. You can also eke out a bit more from certain weapons, like the triple-firing snowballs, which add an additional freeze if you manage to land all three. Or my favorite, the hot rod, which attaches a massive engine to the back of your vehicle. It’ll keep boosting you forward for as long as you discharge it, but wait too long and it’ll explode, taking your momentum. Discharging it also acts as an AOE attack, so sometimes it’s more advantageous to pop it early and catch others around you. It’s all very well considered. Between the combat, driving, and different modes, there’s an astounding amount to master. 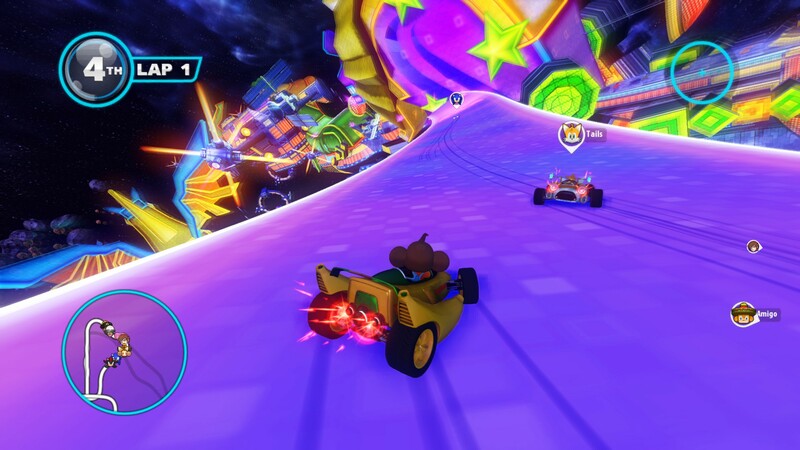 Despite initially seeming like another entry in the crowded space of mascot racers, Sonic & All-Stars Racing Transformed manages to synthesize the legacy of other arcade racers into its own unique form. It manages to stay competitive while still providing opportunity for more chilled sessions when needed. Plus you can ride a vehicle that changes into different SEGA arcade machines and gun down mascots from Football Manager and Shogun Total War. That alone is worth giving it a chance. Tagged with feature, New Testaments, retrospective, Sega, Sonic & All-Stars Racing Transformed, Sumo Digital.